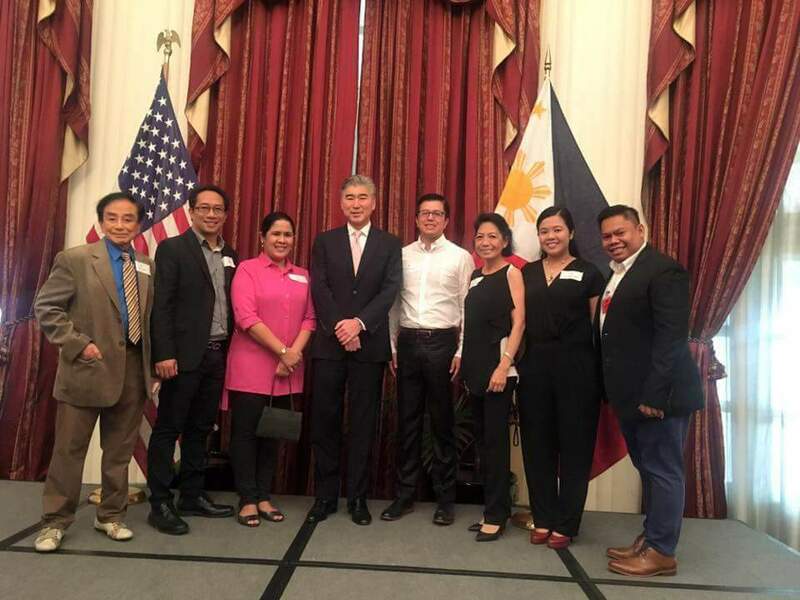 From 2016-17 Humphrey International Fellow Floro Balato Jr.: "May I share to you two photos of my recent participation in the Humphrey alumni activities in the Philippines. 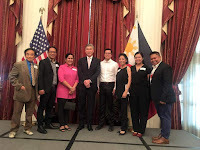 First photo (left) is at the US embassy with US Ambassador to the Philippines Sung Kim together with Humphrey alumni during the send off to this years' Humphrey and Fulbright scholars. Second photo (right) was when I gave an orientation briefing together with our alumni president to the two Filipino Humphrey Fellows (2017-18) this year. One will attend Syracuse University and the other Michigan State. I did this to manifest my commitment and support to the US -PH educational exchange program and honor our duties as Humphrey alumni." Mr. Balato is a Senior Immigration Officer at the Philippine Bureau of Immigration. He formerly served as Chief of the Port Operations Division of the Bureau of Immigration. In that role Mr. Balato supervised the operations of all international air and seaports, as well as border crossings in the country. Mr. Balato has expertise in the detection and prevention of human smuggling and trafficking. He has completed a number of specialized training programs related to that topic, including “Impostor Detection and Facial Image Analysis,” from the Department of Immigration and Citizenship in Canberra and Sydney, Australia in 2009. He obtained his Immigration Management Service certificate from the South Korean Ministry of Justice in 2012. He also finished Interpol’s Capacity Building Program for Counter Terrorism in Asia conducted by the Interpol Integrated Border Management Task Force in Manila, Philippines in 2013. Also in 2013 Mr. Balato was part of an international panel of experts that was consulted in the formulation and drafting of an Issue Paper entitled “Corruption and Smuggling of Migrants” published by the United Nations Office on Drugs and Crime (UNODC) in Vienna, Austria. He was a member of the Philippine team to the ASEAN Experts Working Group that drafted the recently adopted ASEAN Convention on Trafficking in Persons, Especially Women and Children. 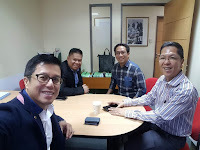 Mr. Balato is currently a member of the Philippine delegation to the ASEAN Experts Working Group crafting the ASEAN Agreement on Cross Border Transport of Passengers and served as one of a group of experts that drafted the Philippines migrant smuggling bill for deliberation by Congress. For his outstanding performance in international law enforcement cooperation he has received awards and commendations from the U.S. Federal Bureau of Investigation, Canada Border Services Agency and South Korea Ministry of Justice, among others. Mr. Balato holds a Bachelor of Arts degree in social sciences from the University of the Philippines, a Bachelor of Laws degree from the University of Santo Tomas, and a Master in Public Management from Ateneo de Manila University.